Karen Burns-Booth presents a novel Christmas gift idea. 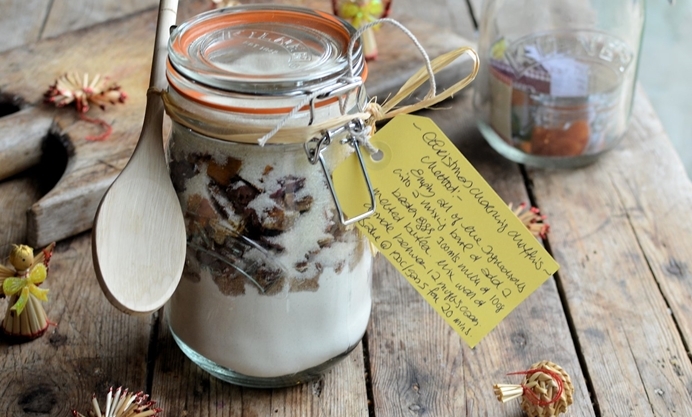 Layer all of the ingredients required to make a batch of festive muffins in a jar (minus the eggs, fat and milk of course! ), add a wooden spoon along with an instruction label and a gift tag and you have an attractive and unusual gift to give this Christmas. I first discovered gifts in a jar when I visited a craft fair in the States many years ago, and I thought what a brilliant idea they were – the gift is in the jar and you get to keep an attractive container as well – recycling at its best. The craft fair had rows and rows of beautiful jars, pots and containers, all displayed with an astonishing array of delicious and decadent contents – from luxury beverage mixes to herbal bath concoctions, I was hooked. Since then, I always include homemade gifts in a jar on my Christmas gift list. 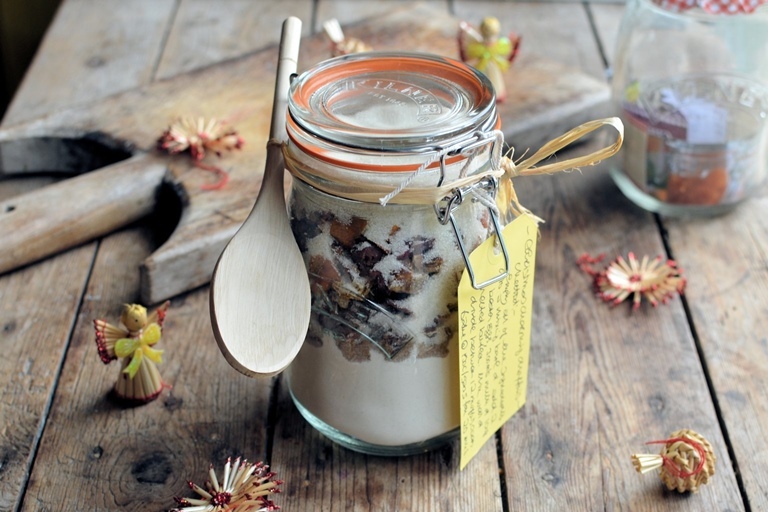 This recipe idea is always well received and what’s even better, is the recipient gets to keep a lovely Kilner jar afterwards, for storage or future cakes in a jar. The recipe I am sharing today for Christmas morning muffins in a jar is based on a recipe I saw in magazine about ten years ago, and I have adapted it to my own tastes and preferences over the years; although, every year I seem to tweak it and change or add something new! 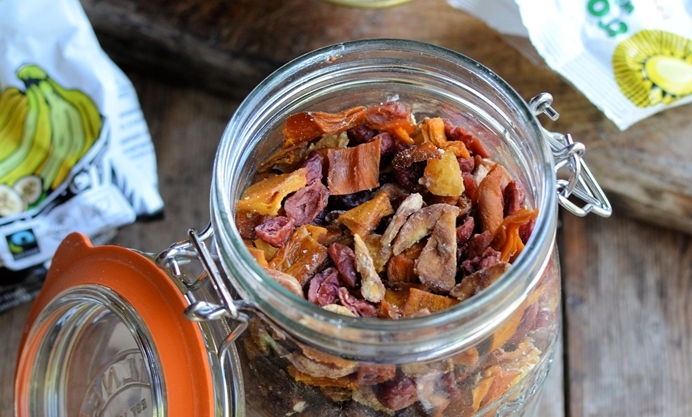 It is a basic muffin mixture with added dried fruits and nuts, and the choice of fruit and nuts is up to you, but I have given my latest ingredients ideas for what I think works really well, especially for a festive Christmas morning treat. To show you just how well this muffin in a jar works, as soon as I had finished layering all my ingredients and no sooner had I tied a wooden spoon to the Kilner jar, I opened it up and baked a batch of muffins! And they were delectable, lightly spiced and full of exotic fruits such as kumquats, banana, mango as well as cranberries, dried mixed vine fruits and chopped pecans. The mixture keeps for up to three or four weeks when given as a gift, as the Kilner jar’s rubber seal keeps it all fresh for quite a while. The mixture makes a dozen large muffins and is presented in a litre jar. The recipe, or should I say the instructions, are shared below, and if you really want to push the boat out why not gift a jar of the mixture as well as a small box of ready-made muffins, so the lucky recipient knows just how delicious they are. I serve these as part of a Christmas morning breakfast buffet with brandy butter and honey. They are also amazing when served with citrus butter and cream cheese and a glass of fizz! If you want to make the muffins yourself, then just dispense with layering the ingredients in a jar, then obviously just follow the cooking instructions (and ingredient amounts) as they would appear when written on the label.